1. Cut a small triangle from the orange card (beak). 2. Cut orange pipe cleaners into short pieces (feet). 1. 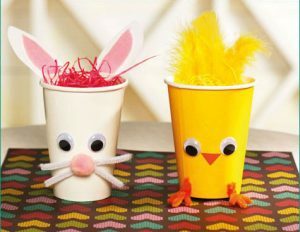 Take the yellow cup and stick the beak to the front of the cup, then stick the wiggle eyes above the beak. 2. Staple or tape a few feathers to the back edge of the cup, making sure they peek out over the top. 3. Twist three pieces of the cut down orange pipe cleaners together at one end for each foot and attach the two feet to the front of the cup with glue. 4. Fill with yellow shredded paper or tissue and some sweets/chocolate!